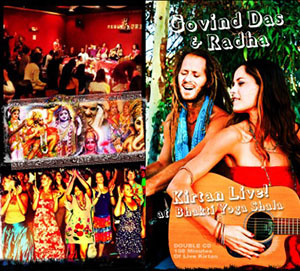 Govind Das and Radha are California-based bhakti yogis, kirtan singers, and as their spiritual names suggest, "Servants of the Divine". They are a husband and wife team with great love and devotion for the Divine, their Guru, each other, and traditional yogic practices of India - This is the essence which is reflected and transmitted through their teachings and music. Through the grace of their teachers, they have uniquely melded ancient Indian mantras with western melodies, yet still playing traditional Indian instruments. Their music has been described as a trance inducing mandala, where the eyes close, voices aned hearts open, and meditation, art, and prayer merge together as One. 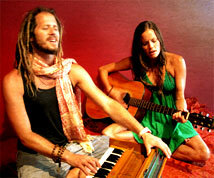 They lead Kirtan concerts, Bhakti yoga workshops, and transformative retreats throughout the world. "KIRTAN LIVE! at Bhakti Yoga Shala"
Kirtan Live! at Bhakti Yoga Shala Come on a Kirtan journey and celebrate the beauty and presence of Love with Govind Das and Radha!Kirtan is the chanting of the Divine Names from the Bhakti Yoga tradition. The moods of kirtan vary from gentle, soft and sweet to singing and dancing with sweaty wild abandon. BYS directors/owners Govind Das and Radha recorded 3 nites of live kirtan in the summer of 2012, with the intention of capturing the spirit, bhav, and devotion of community singing and dancing together in joy, love, and unity. Here is what emerged. At the age of 15 I took my first hatha yoga class at a local gym in my home town of Mona Vale, Australia as a way to relax & counter the effects of the stress of being a teenage model... immediately i felt it's powerful transformative effect and continued to practice regularly. Where are you from and where did you meet? 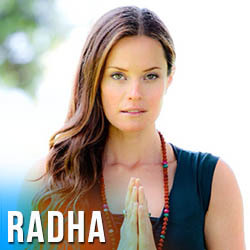 Radha: I am from Australia... Mona Vale, a small beach town a half hour north of Sydney. 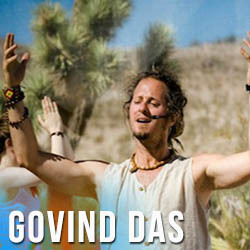 I moved to LA in the year of 2000, and in 2003 I met Govindas in his yoga class at Power Yoga in Santa Monica. Govindas: I am from Rockville, Maryland, just outside of Washington, D.C. I moved to San Diego in 1993, spent 2 years there, then moved to LA in ‘95 and have been here ever since. How/When did you discover yoga, which branch of yoga was it, how did this lead you to kirtan? Radha: When I was a child, my parents would take my sisters and I to Bali for family vacations. It was there that I visited my first Hindu temples and was introduced to the vast tradition of Hinduism and yoga. One year when we were there, I fell in love with a poster of Saraswati. My parents bought it for me and when we returned home I immediately put the poster on my wall. As a child I was majorly involved in music, dance, and theatre. Basically, these kinds of things were my life. Years later I learned that Saraswati is the Goddess of Knowledge, Music, Dance, and the Arts. As I look back it feels as though her presence was blessing my path... and surely continues too. As i grew older at the age of 15 I took my first hatha yoga class at a local gym...Because of my dance backround I fell in love with it and continue to practice regularly. During that time I was a model in Australia, where so much emphasis was placed the outer appearance, the way I looked. Yoga began and continues to teach me to love and feed myself from the inside first. I was first introduced to kirtan when I attended Govindas’s yoga class at the age of 22. Because music was such a major part of my life, immediately it struck a note deep within. I was introduced to Kirtan through the older Neem Karoli Baba devotees: Ram Dass, Bhagavan Das, Krishna Das and Jai Uttal . I was 27 years old and was really struggling with my health. The kirtan and bhakti helped to awaken my faith and gave me a yogic perspective to connect with God. The chanting gives us the opportunity to call out to Spirit, to connect with the Source on a deeper level than just the physical and embrace even the most difficult times in our lives as gifts in which we can learn and grow. Using these practices has helped me become accepting of the days that I feel really terrible. What is it about kirtan that speaks to you? Radha: When I am chanting it is all an offering of devotion to the divine. The divine within myself, the divine within everything... connecting to the Oneness. I grew up performing in musicals and concerts, and it was “a performance.” which was beautiful, yet when I came to kirtan, it gave me the opportunity to to turn my music into a prayer. When Govindas and I came together, it all felt so natural... the Mantras, the blending of our music, voices and hearts. The practice of kirtan is a huge part of our relationship and one of the many beautiful ways that we connect with eachother. 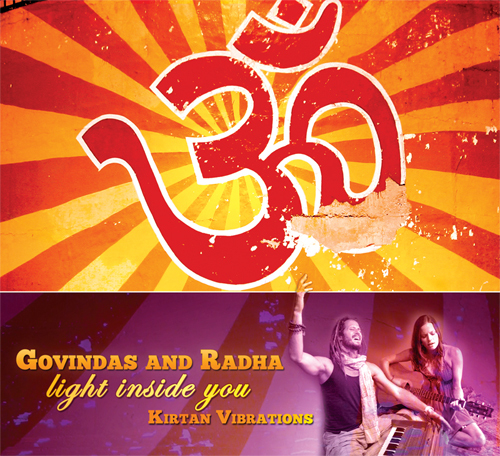 Govindas: When I first heard kirtan, it blew me away. It felt so ancient in tradition. Music as a prayer. As a child I had been exposed to Hebrew chanting, which I fell in love with.. In kirtan, the melodies really touched me. The drumming. The devotion of the leader, the hypnotic call and response. Immediately when I first heard kirtan, I began to immerse myself in the teachings of Bhakti Yoga. I was teaching Vinyasa Yoga, which is still a big part of my practice. I was quite ill so there was this deep feeling inside searching for answers. Through Bhakti I felt my path open a bit wider and become clearer. It gave me an ancient tradition which uses the practices of heart, devotion, love, surrender and God to help in peeling back the layers and facilitate a deeper understanding and harmonization with the energies of life. In 1999 I journeyed to India with the intention of diving deeper. This is where I started studying music and bought my first harmonium. On my return from my trip I began chanting in my yoga classes. What style of hatha yoga do you teach? Radha: We teach what we call Bhakti Vinyasa... and it is not really a class where we are teaching something, but more so of a ritual and yogic adventure using sankalpa(intention/dedication/prayer), simple vinyasa sequences, and kirtan (yogic chanting during asanas)... we feel so blessed to have such amazing hatha yoga teachers: Bryan Kest, Saul David Raye, Shiva Rea, and Mark Whitwell... They are showing us the way. Govindas: it is a sweet expression and exploration of the heart... is merging bhakti and asana practice into one. if you can imagine a room full of people singing in these sacred forms together. What do your names mean? Govindas: Radha and Govindas aren't are birth names... Mine is Ira and hers is Jacqueline... They are our "spiritual names.. They connect us to our Dharma, to serve. In the Hanuman/Neem Karoli Baba tradition, to be a "Das" is to be a "Servant of God". We are servants of Radha and Krishna - This is where I got my name---Govind Das, or Govindas is to serve Govinda. To serve God in the form of Love. To serve that love in each other. Radha: For me Radha is the pure embodiment of devotion itself... Radha connects me with the Mother. In Vrindavan India everyone greets each other as "Radhe Radhe"... Radha and Krishna are Divine Lovers... Radha is us as "individual soul". Krishna is the Universal One... The divine love affair is between self and God. What is going on in the world right now and how can people make a difference in spreading consciousness? Govindas: This is an unbelievable time to be alive!!! The flower of our consciousness is awakening together. We have no other choice... Primarily because of Mother Earth. If we don't take care of our Mother, who knows what is going to happen... It is kind of scary just to even think about it... Though, WE must do something about it!!! We must dedicate our lives to the upliftment and healing of ourselves and this planet. 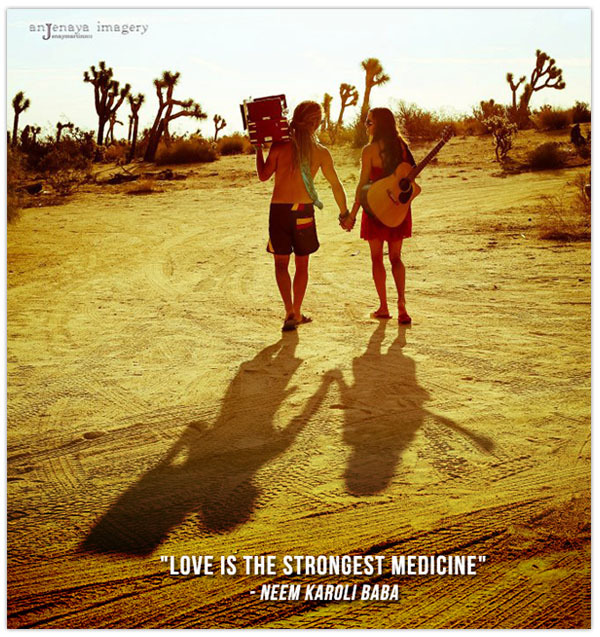 Govindas and Radha: We live on the beach in Malibu and surf as much as possible. we love the "natural high" lifestyle. it seems as though our sadhana and our fun have become one... we love to "serve" people and be with our friends and satsang...and travel.... We go to India once a year to lead a yoga retreat in a paradise... We go visit holy places. We love to visit our families in Australia and Florida. Singing, dancing. yoga. Go LA LAKERS!! !...Being outside and being with Mother Nature... anything in the hills or on mother ocean!!! Jai Ma!! !